As the weather has been so nice lately we’ve been spending lots of time in the garden so I had the idea of making a water table for the kids. I don’t know what it is about water but Cherry and Tiger both love playing with it, and I love them playing with it because it’s far less messy than sand. 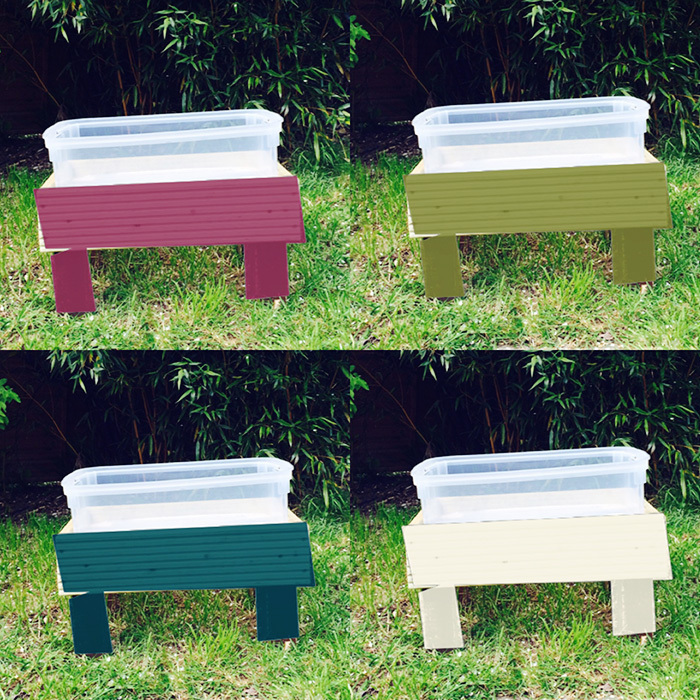 To help plan my outdoor project I used an app called Outspiration (more on this later in the post) and to help make my project I used a man who is much better at DIY than me called Mr C.
I gave him the plastic box I had chosen for it then he made the table. The box fits securely in the top by resting on the four legs. I can’t actually give you instructions on how he made it because I have no idea, he did say it was ‘really simple’ though. I guess that would depend on how good you are with a saw and drill! Then I painted the table, I chose white as I didn’t want it to get hot in the sun. Once it was dry I let Cherry paint some ‘flowers’ on the legs, she used acrylic paint for this. Now for more about Outspiration… It’s an iPhone app created by AkzoNobel and allows you to plan your outdoor project by checking the weather and editing a photo of your project to see how it will look in different colours. It has a section on inspirational trends to help you come up with ideas for things you can do with your outside space. You can also browse other user’s projects as well as sharing your own. The app is free but does require iOS 7 or later. Outspiration is available to download from the Apple App Store and if you download it and enter your details in the ‘win’ section of the app then you can be in with the chance of winning a BBQ and hamper worth £100. The giveaway is running until the 12th of May 2014 so you have plenty of time to download it and enter.